Which expresses all things ? On the heights is peace ? Peace to serve thee ? 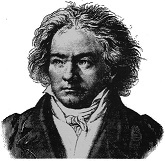 Ludwig van Beethoven (1770 - 1827) came from a musical family and showed prowess as a performer and composer from his earliest days. At the age of 18, his mother's death and his father?s alcoholism left Ludwig responsible for raising his younger brothers. He earned money by teaching music to children and, in what little spare time he had, wrote and performed his compositions. His work caught the attention of Joseph Haydn and Ludwig ultimately moved to Austria to study with the elder composer. By his mid-twenties, Ludwig?s hearing began to fail; by his mid-forties, he was completely deaf. Despite that and a host of other illnesses, he continued to write astonishing orchestral music that permanently impacted the world. Who knew Beethoven wrote poetry too! Lovely sentiment and well-crafted. Thanks. Jayne, you really know how to find these gems. Fine poem for the ages!!! May he now be enjoying John Donne's description of heaven, where there is '...no noise nor silence, but one equal music...' Wonderful Beethoven.